Have you ever started a game that was supposedly "free" only to end up spending more on skins, characters and pets than you have on any full price title? It's happened to all of us. With that in mind, we at theScore esports have done the math to see how much you would have to spend to get the full experience out of some of your favorite games, not counting promotions. Note: Call of Duty: Infinite Warfare's Season Pass does not include supply drop micro-transactions. Judging by our results, if you're looking to save money and you don't care what you play, you're best off with the deluxe edition of Call of Duty: Infinite Warfare. 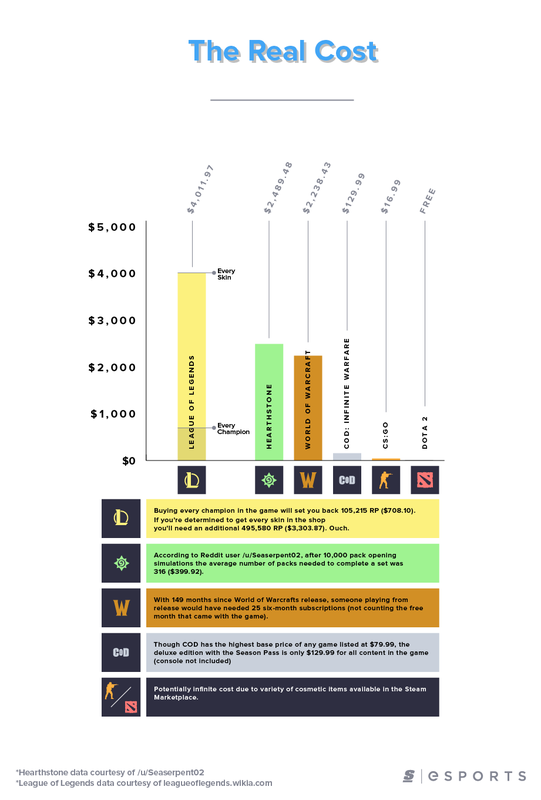 If nothing else, there's less chance of YOLO buying a $40 courier in DOTA 2.